Operation Odyssey Dawn was the U.S. code name[Note 1] for the American role in the international military operation in Libya to enforce United Nations Security Council Resolution 1973 during the initial period of 19–31 March 2011, which continued afterwards under NATO command as Operation Unified Protector. The initial operation implemented a no-fly zone that was proposed during the Libyan Civil War to prevent government forces loyal to Muammar Gaddafi from carrying out air attacks on anti-Gaddafi forces. On 19 March 2011, several countries prepared to take immediate military action at a summit in Paris. Operations commenced on the same day with a strike by French fighter jets, then US and UK forces conducting strikes from ships and submarines via 110 Tomahawk cruise missiles and air assets bombing Gaddafi forces near Benghazi. The goal of coalition forces was to impose a no-fly zone for Libyan government forces. USS Barry fires a Tomahawk cruise missile during Operation Odyssey Dawn. *Libyan health ministry claim has not been independently confirmed and Libyan government figures have been shown as unreliable or misinformation. The U.S. military claims it has no knowledge of civilian casualties. The U.S. initially had strategic command of the military intervention, coordinated missions between coalition members and set up Joint Task Force Odyssey Dawn on USS Mount Whitney for the tactical command and control in the area of operations. but passed complete military command of the operation to NATO and took up a support role on 31 March 2011. Prior to that, an agreement to pass command of the arms embargo to NATO was reached on 23 March, and a handover of enforcement of the no-fly zone to NATO was agreed to on 24 March and became effective the following day. With the handover of coalition command to NATO, Operation Odyssey Dawn remained the name for the activities of U.S. forces, and the coalition's objectives continued to be carried out under Operation Unified Protector. However, NATO's objectives did not include aiding the rebel forces' efforts to take control of territory held by the government. The British name for its military support of Resolution 1973 is Operation Ellamy, the Canadian participation is Operation Mobile, and the French participation is Opération Harmattan. The strategic command of Operation Odyssey Dawn was under the authority of General Carter Ham, the Combatant Commander of the United States Africa Command (AFRICOM), a Unified Combatant Command of the Department of Defense. Tactical command in the theater of operations was under command of Admiral Sam Locklear, the Commander of United States Naval Forces Africa on board the command ship USS Mount Whitney in the Mediterranean Sea. Vice Admiral Harry B. Harris, Commander, U.S. Sixth Fleet, assumed responsibilities as the Joint Forces Maritime Component Commander, also stationed aboard USS Mount Whitney. Major General Margaret H. Woodward was commander of US Air Force aircraft involved in the operation. On 21 March 2011, President Obama stated the U.S. military action would be scaled back soon and was considering handing over command of the operation to either France, the UK or NATO. On 24 March 2011, NATO took command of enforcing the no-fly zone in Libya and was considering taking control of the rest of the mission. On 24 March 2011, the coalition agreed to have NATO command the no-fly zone, and the U.S. Department of Defense stated that the U.S. would relinquish command of Operation Odyssey Dawn as early as 28 March. There are reports of members of JTF2 working with Britain's SAS and SBS on the ground in Libya. Two C-130J-30 military transport aircraft supporting the Norwegian forces. Three B-2 Spirit stealth bombers operating from Whiteman AFB. Two HH-60 Pave Hawk combat search and rescue helicopters from RAF Lakenheath operating from USS Ponce. Over 400 Marines of 1st Battalion 2nd Marines from Camp Lejeune, North Carolina deployed as the Air Contingency Battalion (ACB), on 1 March 2011 to serve as the new Battalion Landing Team for the 26th MEU. The ACB was attached to the 26th MEU on 5 March 2011 at NAS Souda Bay. This was the first time ACB has been used in almost a decade. Two MV-22 Osprey tiltrotor aircraft from the 26th MEU participated in the pilot rescue. Two CH-53E Super Stallions from the 26th MEU participated in the pilot rescue. One KC-130J Hercules from the 26th MEU participated in the pilot rescue. 21h: The first main strike involved the launch of 112 Tomahawk cruise missiles from U.S. and UK ships against shoreline air defenses of the Gaddafi regime. The U.S. Department of Defense reports that the dismantling of Libya's ability to hinder the enforcement of the UN no-fly zone was only the first of multiple stages in the operation. USMC Harriers participated in an air strike against a large military convoy outside Benghazi. All fixed SA-2 Guideline, SA-3 Goa and SA-5 Gammon sites were taken out. Only SA-6 Gainful, hand held SA-7 Grail and SA-8 Gecko mobile SAMs are still a possible threat to aircraft. In the early hours of the day a building from Moammar Gadhafi's compound in Tripoli was completely destroyed by a cruise missile. Twelve more cruise missiles were fired at command and air defense sites. At approximately 22:30 CET (evening of 21 March), a USAFE F-15E 91-0304 operating out of RAF Lakenheath (TDY to Aviano Air Base) crashed about 25 miles (40 km) southwest of Benghazi. Both crew members ejected at high altitude and were subsequently separated. A MV-22 Osprey, supported by two AV-8Bs, two CH-53E Super Stallions, and a KC-130J Hercules from the 26th MEU initially recovered the pilot, while the weapons officer was recovered later after being rescued by rebel forces in the area. Two Marine Harriers accompanying the rescue force dropped two 500 lb bombs at the request of the ejected pilot, prior to the MV-22 landing in an attempt to deter an unidentified group of people heading towards the area. The UK had a "peripheral involvement" in the rescue of the U.S. pilots. Six local villagers, including a young boy, were reported to have been injured by gunfire from the rescuing U.S. forces, A Marine spokesperson aboard USS Kearsarge denied that shots were fired, saying: "The Osprey is not armed, and the Marines barely got off the aircraft. I was in the landing center the whole time, where we were monitoring what was going on, and firing was never reported", Pentagon sources were later reported to have confirmed that shots were fired, but the source of the civilian casualties is still being investigated. Overnight, the U.S. bombed the wreckage of the downed F-15E "to prevent materials from getting into the wrong hands." In a 24-hours period; 175 air sorties were conducted (113 US, 62 coalition). Around this time, the U.S. changed its target priorities from air defenses to Libyan ground forces. Royal Norwegian Air Force F-16s were assigned to the U.S. African Command and Operation Odyssey Dawn. A number of Norwegian F-16s took off from the Souda Bay Air Base on the island of Crete, Greece for their first mission over Libya. Three laser-guided bombs were launched from 2 F-16s of the Royal Norwegian Airforce against Libyan tanks. F-16s from the Royal Norwegian Airforce bombed an airfield in Libya during the night. Coalition planes flew 164 sorties and coalition leaders reported damage to Gadhafi's ground forces. Lockheed AC-130 gunships and Fairchild Republic A-10 Thunderbolt II ground attack aircraft began operations, attacking ground forces. These were the first aircraft used against troops; previous strikes had targeted command and anti-aircraft infrastructure. Two B-1 bombers from Ellsworth Air Force Base attacked undisclosed targets in Libya. Attack submarine USS Providence completed all assigned strike missions and left the area to return to its previous duties. At this point in the mission, the U.S. was responsible for 80% of air refueling, 75% of aerial surveillance hours and 100% of electronic warfare missions. On 28 March, a USAF A-10 and a USN P-3 attacked a Libyan Coast Guard vessel and two smaller craft after U.S. forces observed them firing into Misurata and at merchant vessels. The P-3 fired AGM-65F Maverick missiles at the patrol boat Vittoria, forcing the crew to beach her. The A-10 strafed the other two smaller boats with its 30mm GAU-8 Avenger cannon rounds, sinking one and forcing the crew to abandon the other. The USS Barry provided situational awareness for the aircraft by managing the airspace and maintaining the maritime picture. From 08:00 EET, NATO took sole command of air operations over Libya under Operation Unified Protector, taking over from U.S. Africa Command. The four Danish F-16 fighters flew a total of 43 missions and dropped 107 precision munitions in operation Odyssey Dawn before transiting to NATO command. Establishing these conditions would pave the way for a genuine political transition – of which Qadhafi's departure is a critical component. To bring about this objective, along with the international community, the United States responded to this crisis by developing, implementing, and monitoring sanctions and freezing billions in Government of Libya assets, building a broad international coalition focused on escalating diplomatic pressure on Qadhafi and increasing his isolation, and initiating and sustaining political support for military operations. ... Politically, U.S. leadership continues to play an important role in maintaining and expanding this international consensus that Qadhafi must step down, sending an unambiguous message to the regime. We continue working with the international community to enhance the capabilities of the Libyan opposition and increase the ability to achieve political transition. After many meetings with senior opposition members in Washington and abroad, combined with daily interactions with the U.S. mission in Benghazi, we have stated that the TNC has demonstrated itself to be the legitimate interlocutor of the Libyan people, in contrast to the Qadhafi regime that has lost all legitimacy to rule. ^ From Wired, "The U.S. military's nickname for the no-fly zone in Libya sounds like the beginning of a long adventure. But Defense Department officials insist that there's no hidden meaning behind 'Operation Odyssey Dawn.' It's just the product of the Pentagon's semi-random name-generating system." ^ USS Providence left the area some time around 27–28 March. ^ Cohen, Tom (20 March 2011). "Mullen: No-fly zone effectively in place in Libya". CNN. Retrieved 20 March 2011. ^ "Gaddafi Attacked City of Misrata; US to Bomb More". The World Reporter. Retrieved 21 March 2011. ^ Ackerman, Spencer (22 March 2011). "F-15 Crew Ejects Over Libya After Mechanical Failure". Danger Room, Wired.com. Condé Nast. Retrieved 13 January 2013. ^ a b c d e f g h Lamothe, Dan (22 March 2011). "Details of Marines' pilot rescue released". Marine Corps Times. Archived from the original on 26 March 2011. Retrieved 24 March 2011. ^ Joshua Stewart (5 August 2011). "Navy: UAV likely downed by pro-Gadhafi forces". Navy Times. Retrieved 13 January 2013. ^ "Mid-East crisis as it happened: 25 March ". BBC News. 25 March 2011. Retrieved 25 March 2011. ^ "Vatican: Airstrikes killed 40 civilians in Tripoli". 31 March 2011. Retrieved 31 March 2011. ^ "Gaddafi denounces foreign intervention". Al Jazeera English. 20 March 2011. Retrieved 20 March 2011. ^ CNN Wire Staff (21 March 2011). "Coalition targets Gadhafi compound". CNN. Retrieved 19 May 2011. ^ Carter Ham (19 March 2011). "STATEMENT: AFRICOM Commander on Commencement of Military Strikes in Libya". US AFRICOM. ^ a b U.S. AFRICOM Public Affairs (20 March 2011). "Overview of 1st Day of U.S. Operations to Enforce UN Resolution 1973 Over Libya". US AFRICOM. ^ a b U.S. Department of State (27 March 2011). "TRANSCRIPT: NATO Enforcing All Aspects of UNSCR 1973 in Libya". US AFRICOM. ^ a b c "News Article: Coalition Launches Operation Odyssey Dawn". Defense.gov. 19 March 2011. Retrieved 19 March 2011. ^ "DOD News Briefing by Vice Adm. Gortney on Operation Odyssey Dawn". Defense.gov. 19 March 2011. Retrieved 22 March 2011. ^ Judd, Terri (19 March 2011). "Operation Ellamy: Designed to strike from air and sea". The Independent. UK. Retrieved 19 March 2011. ^ "Gunfire, explosions heard in Tripoli". CNN. 20 March 2011. Retrieved 21 March 2011. ^ a b "NATO No-Fly Zone over Libya Operation Unified Protector" (PDF). North Atlantic Treaty Organization (Fact Sheet). ^ Ola Galal & Alaa Shahine (27 March 2011). "NATO Takes Command of Libya Operation as Allies Step Up Attacks". Bloomberg news. Retrieved 27 March 2011. ^ "Coalition operations in Libya to continue". Ministry of Defence of the United Kingdom. 21 March 2011. ^ General Carter Ham; U.S. Army (19 March 2011). "STATEMENT: AFRICOM Commander on Commencement of Military Strikes in Libya". U.S. Africa Command. Retrieved 19 March 2011. ^ "News Article: Admiral Harris Says Libya Campaign Sustainable". Chattanogga Time Free Press. 15 June 2011. Retrieved 2 December 2011. ^ Green, Peter S. (29 March 2011). "Woodward First Woman to Command U.S. Air Attack in Libya 'No-Fly' Mission". Bloomberg. Archived from the original on 23 April 2011. Retrieved 23 April 2011. ^ Ian Pannell (21 March 2011). "Libya: US 'to reduce role in military campaign'". BBC News. Retrieved 21 March 2011. ^ Sanskar Shrivastava (22 March 2011). "US to Hand Over The Command of Military Operation in Libya to UK, France or NATO". The World Reporter. Retrieved 22 March 2011. ^ "Denmark to send squadron on Libya op" (in Danish). Politiken.dk. 14 March 2011. Retrieved 19 March 2011. ^ "La Russa: Presto altri aerei italiani". rainews24.it. 22 March 2011. Retrieved 22 March 2011. ^ "> Norske fly under amerikansk kommando". fvn.no. Archived from the original on 26 March 2011. Retrieved 19 May 2011. ^ "Fighter jets put under US command : Views and News from Norway". Newsinenglish.no. 23 March 2011. Retrieved 19 May 2011. ^ "Vet ikke hvilke farer som møter dem – nyheter". Dagbladet.no. 20 March 2011. Retrieved 19 May 2011. ^ "Faremo: – Ikke aktuelt å væpne libyske opprørere – Nyheter – Innenriks". Aftenposten.no. Archived from the original on 10 October 2012. Retrieved 19 May 2011. ^ "New coalition member flies first sortie enforcing no-fly zone over Libya". Joint Task Force Odyssey Dawn Public Affairs. 25 March 2011. Archived from the original on 4 May 2011. Retrieved 15 April 2011. ^ "Ministerio de Defensa – Dos cazas y el avión de reabastecimiento realizan la primera patrulla aérea en Libia". Mde.es. Retrieved 19 May 2011. ^ "Las fuerzas españolas tienen luz verde para abrir fuego". larazon.es. Retrieved 5 June 2011. ^ "Spanish Fighter Jets Complete First Patrol Over Libya". webcitation.org. Archived from the original on 24 March 2011. Retrieved 5 June 2011. ^ "UAE fighter jets arrive in Italy for Libya operations". Google. AFP. 27 March 2011. Retrieved 19 May 2011. ^ Dagher, Sam (21 March 2011). "Allies Press Libya Attacks". The Wall Street Journal. Retrieved 21 March 2011. ^ a b "New air missions attack Kadhafi troops: Pentagon". AFP. 29 March 2011. ^ Media, Defense. "U.S. Naval Forces Open Odyssey Dawn, Prepare No-Fly Zone". Navy.mil. Retrieved 21 March 2011. ^ "Greek Defence Ministry: No participation in operations outside the NATO". Keep Talking Greece. 20 March 2011. Retrieved 19 May 2011. ^ a b "Pentagon Briefing slides" (PDF). United States Department of Defense. ^ a b c d "Wide array of U.S. warplanes used in Libya attacks". CNN. 1 April 2011. ^ "Roughead: Ships Were Ready for Odyssey Dawn". American Forces Press Service. 23 March 2011. ^ "Crisis in Libya: U.S. bombs Qaddafi's airfields – World Watch". CBS News. 19 March 2011. Retrieved 21 March 2011. ^ a b c Morning Edition (21 March 2011). "B-2 Bombers From Missouri Hit Libyan Targets". NPR. Retrieved 19 May 2011. ^ a b c Schmitt, Eric (28 March 2011). "U.S. Gives Its Air Power Expansive Role In Libya". The New York Times. Retrieved 29 March 2011. ^ Owen, Glen; Carlin, Brendan; Gallagher, Ian (20 March 2011). "'Odyssey Dawn': U.S. cruise missiles herald the beginning of the end for Gaddafi as the West loses patience with Libya". Daily Mail. UK. ^ Squires, Nick (21 March 2011). "Libya: coalition naval forces gather in Mediterranean". The Daily Telegraph. London. ^ "Qaddafi Is Attacking Civilians With Elite Units, Official Says". Business Week. 26 March 2011. ^ "Air Strikes on Libya – Alan Taylor – In Focus". The Atlantic. Retrieved 19 May 2011. ^ "Marine jets involved in Libya airstrikes". Marine Corps Times. 20 March 2011. Archived from the original on 4 December 2011. Retrieved 22 March 2011. ^ "U.S. officials, opposition warn Libya could get bloodier". CNN. 1 April 2011. ^ "Plymouth Herald". Thisisplymouth.co.uk. Retrieved 19 May 2011. ^ "Live blog:allied airstrikes continue against Gadhafi forces (entry timed at 6:36 am Sunday ET, 12:36 pm in Libya)". CNN. 20 March 2011. ^ Jonathan Marcus (19 March 2011). "Libya: Coalition launches attacks from air and sea". BBC. Retrieved 19 March 2011. ^ Libya live blog: U.S., allies launch missiles against Gadhafi forces CNN. ^ Kirkpatrick, David D.; Bullimer, Elisabeth (20 March 2011). "Allies Target Qaddafi's Ground Forces as Libyan Rebels Regroup". The New York Times. ^ "U.S. Africa Command Home". Africom.mil. Retrieved 19 May 2011. 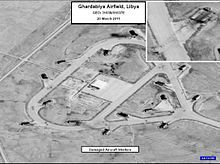 ^ "Crisis in Libya: U.S. bombs Qaddafi's airfields". CBS News. 19 March 2011. ^ "Navy, Marine Corps Aircraft Strike Libya". United States Navy. 20 March 2011. ^ "Libya live blog: Coalition confirms strike on Gadhafi compound". News.blogs.cnn.com. Retrieved 21 March 2011. ^ Tom Cohen, CNN (20 March 2011). "Mullen: No-fly zone effectively in place in Libya". CNN. Retrieved 21 March 2011. ^ "Listen: Secret Libya Psyops, Caught by Online Sleuths". Wired. 20 March 2011. ^ Danske F-16 i aktion over Libyen Archived 13 August 2011 at the Wayback Machine. Forsvaret.dk. Retrieved on 2013-08-16. ^ (in Danish) Medier: Danske F-16 fly er sendt i luften. Politiken.dk. Retrieved on 2013-08-16. ^ "News Transcript: DOD News Briefing by Vice Adm. Gortney on Operation Odyssey Dawn". Defense.gov. 12 March 2009. Retrieved 21 March 2011. ^ "U.S. official: Gadhafi's momentum stopped". CNN. 21 March 2011. ^ Jelinek, Pauline, and Richard Lardner, "General: Coalition strikes more Libya defenses", Military Times, 21 March 2011. ^ a b c Bumiller, Elisabeth (22 March 2011). "Marines Face Questions About Rescue of Officers in Libya". The New York Times. Retrieved 22 March 2011. ^ a b Gabbatt, Adam; Tran, Mark; Haynes, Jonathan (22 March 2011). "Libya air strikes – Tuesday 22 March part 1". The Guardian. London. ^ "Libya air raid 'killed civilians'". BBC News. 31 March 2011. ^ Landler, Mark; Erlanger, Steven (22 March 2011). "Obama Seeks to Unify Allies as More Airstrikes Rock Tripoli". The New York Times. ^ Fontaine, Scott; William McMichael (22 March 2011). "F-15 crashes in Libya; crew 'safe'". Marine Corps Times. Archived from the original on 5 April 2012. Retrieved 22 March 2011. ^ "U.S. rescue team shoot six Libyan civilians rushing to greet downed American fighter crew". Daily Mail. UK. 22 March 2011. Retrieved 19 May 2011. ^ "Channel Four TV". Channel4.com. Retrieved 19 May 2011. ^ Gus Lubin (22 March 2011). "REPORT: U.S. Marines Shot Six Villagers While Rescuing Downed Pilot". Business Insider. Retrieved 19 May 2011. ^ "U.S. bombs wreckage of F-15 fighter jet in Libya". MSNBC. 23 March 2011. Retrieved 19 May 2011. ^ "DOD News Briefing with Rear Adm. Hueber via Telephone from USS Mount Whitney". U.S. Department of Defense (Public Affairs). 23 March 2011. Retrieved 23 March 2011. ^ Bumiller, Elisabeth; Kirkpatrick, David D. (23 March 2011). "Allies Pressure Qaddafi Forces Around Rebel Cities". The New York Times. ^ "Her flyr norske jagerfly mot Libya – VG Nett om Libya". Vg.no. 24 March 2011. Retrieved 19 May 2011. ^ "To norske F16-fly har tatt av fra Souda Bay-basen – nyheter". Dagbladet.no. 24 March 2011. Retrieved 19 May 2011. ^ "Norske fly i kamphandlinger i Libya – Nyheter – Innenriks". Aftenposten.no. Archived from the original on 26 July 2012. Retrieved 19 May 2011. ^ "Norske fly bombet flybase i Libya i natt – nyheter". Dagbladet (in Norwegian). 26 March 2011. Retrieved 26 March 2011. ^ "Rebel forces hold key city, advance west". CNN. 26 March 2011. ^ a b "New air missions attack Kadhafi troops: Pentagon". AFP. 28 March 2011. Archived from the original on 29 March 2011. Retrieved 29 March 2011. ^ "Ellsworth Airmen join Operation Odyssey Dawn". Rapid City Journal. 29 March 2011. ^ "DOD News Briefing with Vice Adm. Gortney from the Pentagon on Libya Operation Odyssey Dawn". U.S. Department of Defense (Public Affairs). 29 March 2011. Retrieved 29 March 2011. ^ Farley, Robert (29 March 2011). "P-3 and A-10". Information Dissemination. Retrieved 19 May 2011. ^ "NATO Press Briefing". NATO. 31 March 2011. ^ Joint Task Force Odyssey Dawn Public Affairs. "US Navy P-3C, USAF A-10 and USS Barry Engage Libyan Vessels". Navy.mil. Retrieved 19 May 2011. ^ "NATO Assumes Command of Libya Operations". Department of Defense. 31 March 2011. ^ Mission update 1. april Archived 28 May 2013 at the Wayback Machine. Forsvaret.dk (2011-10-11). Retrieved on 2013-08-16. ^ "White House defends Libya response". CNN. 25 March 2011. ^ "United States Activities in Libya" (PDF). s3.documentcloud.org. 9 June 2011. Wikimedia Commons has media related to Operation Odyssey Dawn.